(L-R) Malachy Gribben, commercial director of Telestack; Rick Patek, group president - aggregate and mining international of Astec Industries Inc; Steve Harper, executive director international business of Invest NI; Martin Dummigan, managing director of Telestack. Image c/o Invest NI. An Omagh-based firm that specialises in mobile bulk material handling systems has won a £5m contract to help deliver Oman’s Port of Salalah expansion programme. Telestack is taking on its largest-ever single order for Oman, supplying shiploading machinery capable of handling a variety of materials including limestone and gypsum. According to a report by The Irish News, the machinery will be operational later this year. The Port of Salalah is partway though a $15bn infrastructure investment project, designed to cater for the export requirements of its local mining, quarrying and cement industries. Speaking at last month’s Hillhead Quarry Exhibition, Telestack commercial director Malachy Gribben described the contract win as a “massive achievement”. 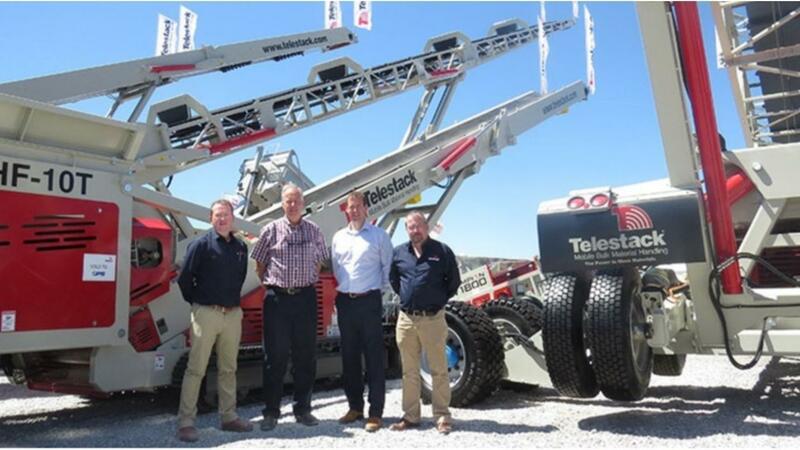 He said: “This is our tenth Hillhead and our display this year demonstrates how Telestack’s investment in new product development, coupled with input from our industry leading global dealer network, produces the most innovative and consistently reliable equipment in the material handling market. “Endorsements such as the Port of Salalah contract are a massive achievement for us but we don’t take this success lightly. In this business you have to earn experience and our customers deserve our continual investment. Steve Harper, executive director of international business at regional economic development agency Invest Northern Ireland, added: “Telestack contributes significantly to Northern Ireland’s materials handling industry and its export success is indicative of the company’s growing, global customer base.